We have a new website. We feel the techinical difficulties of this blog are becoming too much to handle so we have swtiched to wordpress. The Chien-Ming Wang era in New York has finally ended (*mixed boos and cheers*). The Yankees decided on not tendering Wangs contract before the 11:59pm deadline Saturday. New York opted to tender contracts to outfielder Melky Cabrera and pitchers Chad Gaudin and Sergio Mitre. The decision basically came down to starters/trade bait. Cabrera is the current left fielder (and trade bait), and Gaudin and Mitre are current candidates for the back of the rotation. Had the Yankees tendered his contract, arbitration would have given him 20% less than his $5 mil. contract for this season. In 104 career starts as a Yankee, he went 55-26 with a 4.16 ERA in 5 seasons as a Yankee. Of course, his two 19-win seasons were considered his best, and his accuracy was pin-point. He started 2008 8-2 and everyone remembers that one June day in 2008 in Houston when he tore a muscle in his foot and sprained his ankle rounding third base causing him to be out until September. Then this past season came, and he got knocked around and had a record of 1-6 with a 9.64 ERA before he was shut down for the season due to shoulder surgery. Wang and his agent expect to get offers from other teams very soon, and if it would be from the Yanks it would be for much less money. Better Player of the Decade for the Yankees: #1 Derek Jeter or #3 Alex Rodriguez? Mariano Rivera defeated Alfonso Soriano 18-1 in the last matchup. Question for my blog readers: Which site do you think looks better? This or This? I am in the process of considering a new blog outline/template. Due to technical difficulties all sidebar options of the blog are at the bottom of the page. Andy Pettitte defeated Enrique Wilson 18-0 in the last matchup. Very sorry, but due to technical difficulties the polls are at the bottom of the screen, not the right side. Very sorry. Keeping Your Eye on the Ball? Not Possible. Every once in a while we here at the Pinstriper like to talk amongst ourselves about the myths of baseball. So we decided why not share what we have discussed with our lovely readers? Aynone who played baseball, or any other sport involving a ball, as a child always heard the same advice over and over and over. Keep your eye on the ball. Keep your eye on the ball. You were supposed to keep your eye on the ball while you were hitting, fielding, and running. Heck, you had to watch that ball while you were on the bench. It was beaten into your brain like multiplication tables. But is it even possible? At the major league level, scientists say no. A study by Ken Fold who is a visual psychophysicist who works at the University of New Hampshire concluded that it was physically impossible for hitters to keep their eyes on the ball. When the ball is traveling at major league speeds between 90 and 100 mph players can only see the ball 5 to 6 feet in front of the plate at best. So the next time you see Johnny Damon's head fly around in the box and his eyes start drifting towards the right field fence, don't get so upset, he can't do much better. On a side note, how great would it be to have Fold's job title at Holiday parties or around the family table? So Bobby, what do you do now? Oh I am a publicist for a small chain of grocery stores. Thats nice, what about you Ken? Visual psychophysicist. No contest. We will be back soon with more baseball myths. Thanks for reading! Andy Pettitte got the shutout 19-0 in the last matchup. The New York Yankees made a very surprising choice with the first pick of the Rule 5 Draft. 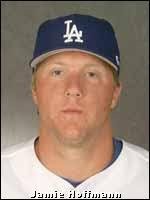 They chose Jamie Hoffmann of the Los Angeles Dodgers. Hoffmann, a former 8th round pick of the NHL's Carolina Hurricanes, could make the club as a fourth outfielder. Hoffmann seemed to hit about 9-11 homeruns a year, with a solid batting average of .275+ and is known to have pretty good speed. He could steal up to 20 bases a year. Hoffmann is also known as a solid hitter against lefties and a great fielder. Personally, I would have taken Kroenke now that Coke is gone, but I am not too upset with the selection. Zach Kroenke was taken by the Arizona Diamondbacks. Kanekoa Texeira was taken by the Seattle Mariners. Analysis: I find it very impressive that Yankees keep getting chosen in the draft. It says something about their minor-league system. Jamie Hoffmann sticks with the Yankees and makes their regular season roster. He is returned in June when the Yankees trade for a veteran version of him. Zach Kroenke does not make the Arizona Diamondbacks and is returned. He does have a clause where he can become a free agent, but he chooses to go back to the Yankees, as they promise him a spot on the 40-man roster. Kanekoa Texeira makes the Seattle Mariners and sticks with them for the entire 2009 season. We move from the topic of pitchers on to outfielders, which believe it or not, is still a team need. 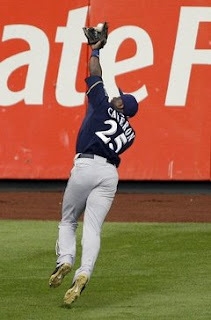 Mike Cameron, 36, is one of the best available outfielders not named Bay or Holliday. You might be wondering why the Yanks need another outfielder even though they just got Curtis Granderson. Well, with Granderson, we now have four outfielders; Brett Gardner, Melky Cabrera, Nick Swisher and Granderson. Many people are anticipating the resigning of Johnny Damon. And with this, many people anticipate the trading of Nick Swisher. Which leaves us with a very good centerfielder, a decent corner outfielder in Cabrera, a fast outfielder who needs to improve his hitting, and an aging corner outfielder with no arm. Our minor league outfielders could be drafted away from us, as Shelley Duncan and John Rodriguez are expected to be drafted in the Rule 5. So we’re left with Colin Curtis, and newly signed Jon Weber and Eladio Moronta as our backups in case of injury/other needs. Cameron has always hit for a low average and many strikeouts, but he is a perfect middle-bottom of the order hitter because of his power and speed. He hit just .250 last year but hit 25 home runs and 70 RBIs (and his home was Miller Park, typically a pitchers park). Though his speed has been decreasing over the years, he can still cover the outfield and still has a great arm, which would make his transition to a corner spot (most likely left because of said speed, and Melkys cannon for RF) much easier. He has 3 gold gloves under his belt, most recently in 2006. Cameron would be a great fit in New York for several reasons. We know he can handle the New York media, as he spent 2004-05 with the Mets without any controversy (many remember him for his nasty collision with Carlos Beltran, breaking several bones in his face and causing him to miss the rest of the season). Second, he hits well against AL East teams for the most part in his career; 10 HR 26 RBI vs Boston, 3 HR 23 RBI vs Baltimore, 6 HR 27 RBI vs Toronto, and 5 HR 22 RBI vs Tampa Bay. Remember, his six full seasons in the AL were with Seattle and Chicago, who would face these teams a max of 10 times a year. - Damon not signed, Swisher stays- Cameron bats in front of Swisher because of speed and better clutch hitting; Swisher becomes everyday DH with ability to start in the OF when needed. If the Yankees sign him, look for a 2-year, $17 MM deal. Cameron has said that he wants to play for a team with a chance at the postseason, let’s see if the Yankees make a run at him. -Jonathan Mayo says that the Yankees may have the Nationals (who techinically own the pick but will draft a player of the Yankees choosing) draft Zach Kroenke. This is to protect Kroenke from being drafted by other teams. The Nationals would then return Kroenke to the Yankees immediately. -Chad Jennings predicts that the Yankees will draft either Chad Tracy (the minor-league son of Jim Tracy, not the former Diamondback), or Matt McBride. -Steve Henson reports that the Yankees will likely draft Arquimedes Caminero. -Frankie Piliere hears that the Yankees will draft John Raynor, though he does not know where they would put him if they drafted him. Better Player of the Decade for the Yankees: #1 Andy Pettitte or #6 Orlando Hernandez? Roger Clemens defeated Chuck Knoblauch 16-1 in the last matchup. Chad Jennings is a former beat writer for the AAA Scranton Yankees. He took over as a Yankees beat writer in October and has agreed to do a quick interview with The Pinstriper. We thank him for the interview. Enjoy and don't forget to check out his work here! 1. Thoughts on the Curtis Granderson trade? Who got the best of it? I think every team got what it wanted. Granderson is a great fit for the Yankees. They gave up some real talent to get him, but that's what it was going to take for an impact player like that. I think some people are getting a bit too caught up in his splits. They're bad, and they're a factor in judging him as a hitter, but at the end of the day he's consistently hit 20+ home runs with 70+ RBIs while playing good defense in center field. He's also young and signed to a good contract. 2. Can you profile Austin Jackson and Ian Kennedy for us? Jackson is going to be an everyday center fielder, but his lack of power suggests he'll be more of a bottom-of-the-order hitter. He could develop more power and become more of an impact bat -- wouldn't surprise me, actually -- but right now he's a guy with a little bit of speed who hits for a high average despite striking out a lot. He's also a good defensive player in center field. Kennedy started throwing a two-seam fastball during the Arizona Fall League and his curveball has improved since his bad 2008 stint in New York. It's easy to overlooked that he's been absolutely dominant in the minor leagues and that he pitched very well in the big leagues when he was first called up in late 2007. He throws strikes -- quality strikes -- and that makes him a good pitcher. 3. Any idea who the Yankees might want in the Rule 5 Draft? What position? Can't figure it out, to be honest. Infield makes no sense because the 40-man is already packed with utility candidates, I can't imagine the Rule 5 providing a better backup catcher than Francisco Cervelli, and if the Yankees wanted a power arm, why not protect Grant Duff or Kevin Whelan? There are a few right-handed hitters available who can play the outfield and also have experience at catcher. I wonder if that might work for the Yankees, giving them a little bit more outfield depth -- which they need -- as well as a spare catcher for days when Cervelli is behind the plate and Jorge Posada is the DH. 4. Any idea of any players that might be taken from the Yankees? I think Zach Kroenke will be taken, I think Kevin Whelan should be taken and I think Colin Curtis might be taken. There are other candidates -- Jason Hirsh, George Kontos, Grant Duff, Alan Horne -- but I tend to think Kroenke, Whelan and Curtis are the guys most at risk of being taken. 5. Do you think the Yankees need to improve the bullpen at all or they are good as it is? I don't think they have to make a bullpen move, partially because I think they'll sign Andy Pettitte plus one more starting pitcher. That could leave either Phil Hughes or Joba Chamberlain to return to the eighth inning (I still think they should both be starters, but that's a whole other issue). David Robertson and Mark Melancon are also legitimate options for high-leverage bullpen roles. And you never know what young starter they might convert to the pen. If they were willing to move Hughes, they're willing to move anyone, and guys like Ivan Nova and Zach McAllister might work well in that role. You never know. 6. Is Zach Kroenke an MLB option at this point? Was he part of the reason they were willing to trade Coke? I think Mike Dunn was the reason the Yankees were willing to trade Coke. After last year, it's hard to believe the Yankees see Kroenke playing a role in the big leagues. Kroenke was terrific in Scranton/Wilkes-Barre last year. When he didn't get a shot then, and when he wasn't added to the 40-man this winter, it became obvious that the Yankees don't view him as much of a major league option. I hope he's taken in the Rule 5 because he deserves a shot. 7. If you had to predict the rotation for next year what would it be? I think they'll bring someone else in to compete, but unless that person is Ben Sheets or Rich Harden, I think it's entirely possible that Hughes and Chamberlain will outpitch the new competition and win the job. 8. The outfield? What could Melky Cabrera net in a trade and are the Yankees definitely more willing to trade him rather than Brett Gardner? The short answer is, I have no idea. Cabrera is an enigma on the trade market. He's still cheap and he's coming off a nice year, but is his trade value that of a starting center fielder or a fourth outfielder? Everyone seems split on the way they ultimately view him. As for which one I would trade, it's no secret that I really like Gardner, but I'm not sure it makes sense to have two left-handed center fielders. Brian Cashman was a busy man yesterday acquiring Curtis Granderson, and today he finalized a deal to bring Andy Pettitte back to the Bronx. The contract is rumored to be a one year deal worth $11.75MM. We are all glad to see you back Andy! UPDATE: 1:38 PM: Brandon here. I like the move for both sides. Pettite gets a ton of money to return to the Bronx and the Yankees get a solid #3 or #4 starter. I was sort of hoping that he would give the Yankees some kind of a discount....but no. Prediction: Pettite goes 12-8 with a 4.35 ERA. He does not go on the DL at all. Paul O'Neill defeated Hideki Matsui 22-6 in the last matchup. I love that the Yankees have picked up the lefty centerfielder Curtis Granderson. He seems to be a class act, a good fielder, and a good hitter (though he is terrible against lefty pitching) with speed whose power will be augmented by Yankee Stadium. Of all the players the Yankees were rumored to be looking at outside of their own club this off season, I thought Granderson would be the best buy. The Yankees gave away a good prospect in Austin Jackson, sending him and lefty Phil Coke to the Tigers. They also shipped off Ian Kennedy to the Diamondbacks to secure the 28 year old Granderson who is a combination of speed, power, and youth that will do some damage in pinstripes. While this was more than I had anticipated the Yankees were going to need to give away, it is not unreasonable and I am fairly confident that Granderson will make it a worthwhile deal. My prediction is that he hits around .270 with 30 homeruns and 70 RBI's with 25 steals. I know it is a lofty prediction but it is certainly attainable and expectations are always high in the Yankee Universe. Check the post below for more analysis of the Granderson trade. UPDATE: 5:40 PM: Brandon, here! Had my friend edit some pictures and get the traded players in their new teams caps. Little obvious that it was edited, but still, I find them interesting. The New York Yankees have acquired Curtis Granderson from the Detroit Tigers in a three-team trade. Analysis: Love the move for the Yankees. The Yankees are essentially getting a better version of Jackson and giving up Ian Kennedy, who has been often injured but still has a bright future, and Phil Coke. Coke is not a necessary piece for the Yankees, of whom have Damaso Marte, Mike Dunn and Zach Kroenke. -Jack Curry has left the NY Times. -Peter Gammons has left ESPN. -Ivan Rodriguez has signed with the Washington Nationals. -The Mariners are "unlikely to get involved" in the Jason Bay sweepstakes. UPDATE: 3:30 PM: Looks like each team got a fair amount in the trade. Jackson will most likely have a solid MLB career, as long as he can get some of his power back. Kennedy will likely be a 4th starter or 5th starter in the MLB if he can heal from his injuries. Coke will make a good lefty specialist for the Tigers. As for Granderson, with the short porch in right field, he could hit up to 35 HR. Add about 20-25 SB and 70-80 RBIs, I'll take it. If Jackson can hit better against lefties (.183 Batting Average, .239 Slugging, .245 On-Base) he can prove to be a nice acquisition. 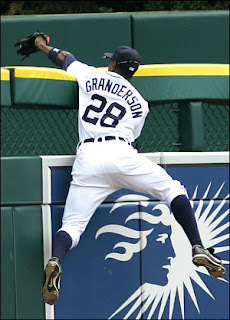 Don't forget Granderson hit .302 as recently as '07 and hit .280 in '08. Prediction: Granderson hits .268 with 32 HR and 75 RBI in '10. 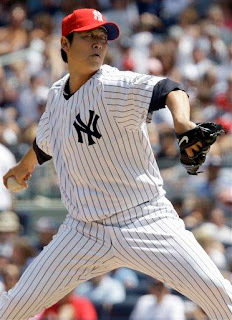 Better Yankee of the Decade? Which Blog Template do you like better? Welcome to the Pinstriper! This blog will be host to Yankees talk and rumors and of course, Yankees everything! Also, feel free to comment anything, as I will always reply. We are on twitter here and here! Feel free to email us at bco004@yahoo.com! Go ahead and bookmark us, as we update the blog daily and often!